With an increasing focus on consumer engagement, many media producers have taken to expanding existing media franchises across different platforms. Beyond simply mirroring the same story across platforms, in transmedia storytelling “each medium makes it own unique contribution to the unfolding of the story” and gives a unique, but independent, fragment of story (Jenkins). Valve Corporation for the last several years has embraced transmedia with increasing fervor as a method of supplementing the stories of their popular video game franchises. 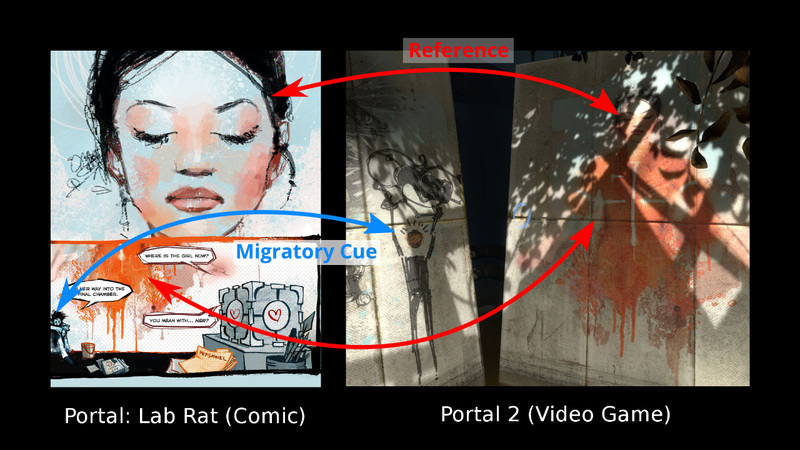 A particularly rich example of how Valve has integrated an existing franchise into a transmedia experience is their comic, Portal 2: Lab Rat, produced alongside the 2011 release of their video game Portal 2. Starting with the humble release of the short space warping puzzle video game Portal in 2007, the Portal franchise has since branched out across multiple forms of media to become a true transmedia experience. The video games Portal and Portal 2 form the backbone of the Portal franchise and have been accompanied by the release of two sophisticated alternate reality games (the first of which required players to at one point contact an obscure phone number to connect to a modem in the kitchen of a Portal developer’s house), several animated vignettes, and the aforementioned comic book titled Portal 2: Lab Rat. 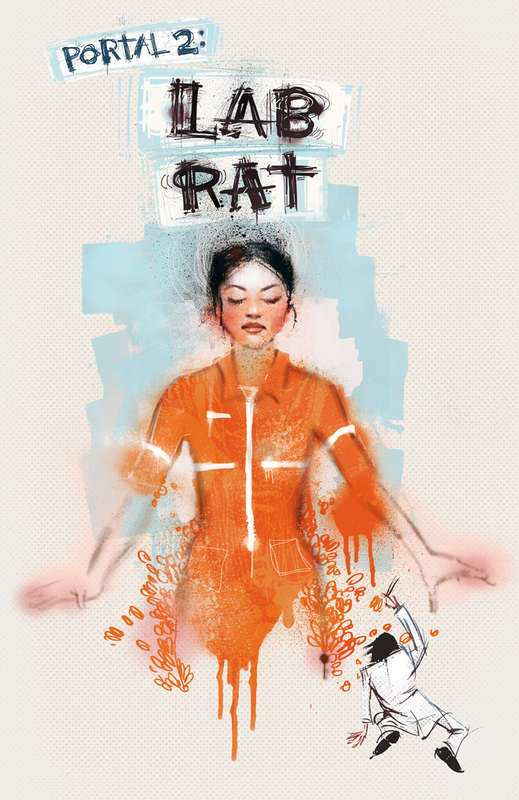 The comic was released online for free and bridges the gap between Portal and Portal 2 with a separate story that follows a new character: a schizophrenic scientist known as the Ratman. In the first Portal, there are several references to an obscure character whose “rat dens” (pictured below, left image) are found hidden behind the sterile walls of the “test facility” the player spends most of the game. Since the creator of these spaces, which contain strange and psychotic scrawlings and images, never appears in the game, the game creates a sense of mystery and a feeling that the world of the game is larger than what is shown in the game. This creates negative capability, or in the words of Henry Jenkins, a set of “potential plots which can not be fully told or extra details which hint at more than can be revealed” (Jenkins). Interactive puzzle games, according to Janet Murray, “have a slower pace of engagement” and can “take advantage of this slower pace to offer a richer level of story satisfaction” (Murray 52). Indeed, Portal can get away with hiding narrative elements, like the rat dens, in the environment for this reason and can safely assume most players will see them as they carefully traverse each map looking for a solution for each puzzle. The shadowy character is revealed in Portal: Lab Rat, whose signature scrawls feature in the background of the first page (shown above, right image). The story features Doug Rattmann (or simply, the Ratman) who follows the game character in the events near the end of the first game. By explaining who the character is, Valve has not only filled the void left by the negative capability created by the secret rat dens, but has also fulfilled fans who want to know more about the underpinnings of the game’s environment and plot. In Portal 2, the Ratman’s writings appear with more prominence and play a slightly more important role in the game than in Portal. However, the actual Ratman character is still only referred to symbolically and indirectly; a character whose actual plot is ancillary to the game’s main plot. These symbolic images, such as the one seen in-game below (right image), drive more interest in the character. In contrast with the references in Portal, these references are more direct, and perhaps more significantly, exist in reference to the story in the comic which did not exist when the first Portal was released. Because of this, these references become migratory cues, or hints to the player that there is a connection with another story that is not being told in the game, which in this case, can be found in the comic. This transition from a reference to a character that does not exist in any medium to a direct reference to a character who does exist in comic book form, highlights a key similarity between negative capability and migratory cues. As Geoffrey Long observes, media producers are capable of “utilizing negative capability to craft potential migratory cues,” like the references in the original Portal, which can then “become actualized as migratory cues when those extensions are made available,” as in the case of Portal 2 and Portal 2: Lab Rat (Long 60). Looking at this transmedia extension shows how a media producing company, like Valve, can extend a successful work into a larger transmedia experience through the use of negative capability and migratory cues. The disjoint, but canonical, nature of each story creates a “unified and coordinated entertainment experience” that ultimately creates a rich experience for fans of the franchise. Long, Geoffrey A. Transmedia Storytelling: Business, Aesthetics and Production at the Jim Henson Company. Thesis. Massachusetts Institute of Technology, 2007. N.p. : n.p., n.d. Print. Murray, Janet Horowitz. “Harbingers of the Holodeck.” Hamlet on the Holodeck: The Future of Narrative in Cyberspace. New York: Free, 1997. 53. Print. In 2011, author Hugh Howey released the first novella in what would become the Wool series; a postapocalyptic sci-fi series that has become something of a case study for the success of self-publishing. With the series gaining mounting success over the last three years, being on the The New York Times e-book list for two weeks and selling over half a million copies, it is interesting to examine the series’ Wikipedia page and see in what way this popularity is reflected in the content of the page (Randall; Alter). The existence of WikiProjects is a good example of what Henry Jenkins notes in his article “What Wikipedia Can Teach Us About New Media Literacies” when he mentions that “practices have emerged around Wikipedia as the community has sought to flag problems to be addressed and identify people with the skills and knowledge needed to solve them” (Jenkins). The WikiProject is one such practice that allows for consistency across articles and for communities to form towards common purposes. This very concept of “the ability to pool knowledge and compare notes with others towards a common goal” is in fact precisely the definition of collective intelligence. 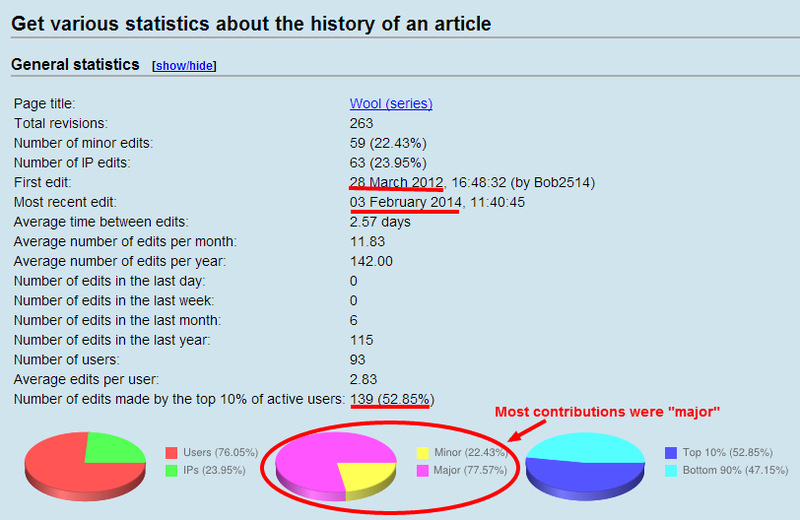 On the Wool page, there were 93 contributors and 263 revisions, 77% of which were considered major revisions. A small 10% of users were responsible for about half of all edits on the page, showing that the content of the page is influenced by the voice of a few users. 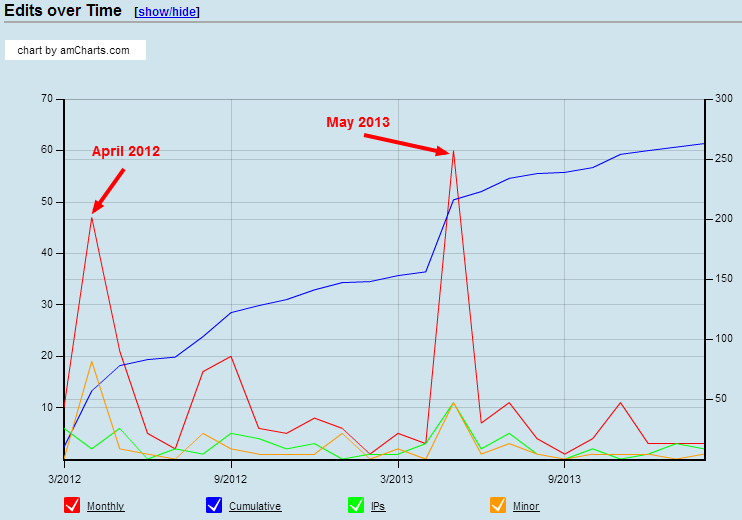 The second spike was in May 2013 when Amazon first revealed their fan fiction site “Kindle Worlds” (Amazon). While the Wool franchise was not a part of this initiative until June 2013, this inspired two users to add an entire section dedicated to Wool fan fiction (of which there was already an abundance) and speculation about Wool being a part of Kindle Worlds (Howey). This led to a brief edit war when another user removed this section, the original writer re-added it, and then it was finally removed after a section in the talk page was created addressing the issue. This back an forth and final discussion is an important part of the process of collective intelligence. In the Henry Jenkins article, he quotes Peter Walsh who says: “Debates about rules are part of the process by which knowledge gets generated” (qtd. in Jenkins). The above is an example of one such debate, and it shows that even an article with a small number of contributors can still exhibit collective intelligence through organized disagreement and debate. In summary, the article for the Wool series is an interesting case study for collective intelligence on Wikipedia for an article with a relatively small number of contributors. Indeed, the article is lacking in substantive information about the series, which is why one must approach Wikipedia with “informed skepticism” and the knowledge that the page may not render the topic in its entirety (Jenkins). Alter, Alexandra. “Sci-Fi’s Underground Hit.” The Wall Street Journal. Dow Jones & Company, 14 Mar. 2013. Web. 16 Feb. 2014. <http://online.wsj.com/news/articles/SB10001424127887324678604578340752088305668&gt;. Amazon. Amazon Media Room. Amazon Publishing Introduces “Kindle Worlds”Amazon Media Room. Amazon, 22 May 2013. Web. 16 Feb. 2014. Howey, Hugh. “Where Words Become Worlds.” Hugh Howey. N.p., 19 June 2013. Web. 16 Feb. 2014. <http://www.hughhowey.com/where-words-become-worlds&gt;. Jenkins, Henry. “What Wikipedia Can Teach Us About New Media Literacies.”Confessions of an AcaFan. N.p., 27 June 2007. Web. 16 Feb. 2014. <http://henryjenkins.org/2007/06/what_wikipedia_can_teach_us_ab_1.html&gt;. Randall, Rachel. “How Hugh Howey Turned His Self-Published Story “Wool” Into a Success (& a Book Deal).” Writer’s Digest. N.p., n.d. Web. 23 Jan. 2014.